Affordability continues to be a sticky subject in the Reno housing market. The economy managed to slowly rebound from its huge downfall in the mid to late-2000s thanks in large part to its appeal for businesses in nearby Silicon Valley as well as other large corporations. However, their move into our area put a stranglehold on availability which builders are currently trying to catch up with. 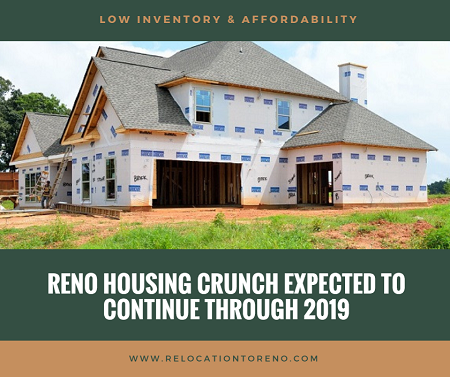 And we may not see relief in the Reno housing crunch until sometime in 2019. Construction was big business for our community before the economic downturn of the last decade. That’s why it took longer for Reno to pull itself up. Builders want to relieve the Reno housing crunch. But current demand drives up costs. They must sell homes in the $400,000 range in order to turn a profit due to the cost of land, materials, and labor. Unfortunately, Reno buyers need homes in the $250,000 range. Typically, the Reno real estate market should maintain around five months of inventory to be considered an even market. Currently, the market shows 1.5 months of supply. However, in the $250,000 and under range, it’s as low as two weeks. To increase inventory faster, we need to have homeowners and investors sell their homes and move out of the area. But only a small number of homeowners do that. So, the only way out of this Reno housing crunch is through more building. And that will take time. The two main challenges Reno buyers face at the moment are finding the right home and having choices. When a property comes onto the market in the “affordable” range (around $250,000), you’re most likely going to come up against a multiple bidder situation. So, you need to be prepared. Gather all the documentation you need and get pre-approved for a home loan. That way, you can put in a sound offer right away. Renters face the same challenge. Currently, the Reno market is experiencing a less than 2% vacancy rate. Rents are up. In fact, according to Adobo, a leading apartment tracker, Reno’s rents came in fourth highest for increases across the country, right behind Newark, NJ, Corpus Christi, TX, and St Paul, MN. It used to be that a 2 bed/2 bath apartment would cost between $800 and $1000 per month. However, now renters pay between $1200 and $1400 a month. Higher rents make it harder to save money for a home purchase…provided you can even find a Reno home in your price range. What Should Reno Buyers Do? The best piece of advice for I can give any Reno buyer is to get your finances in order. Talk to a lender. Get pre-approved. Hire a Reno REALTOR@ to work on your behalf. They know the area, including what’s available. They can also provide you with the good, the bad, and the ugly of any location.